Daily Bible Verse 101: Cursed is the man who trusts in human beings. Cursed is the man who trusts in human beings. "Cursed is the man who trusts in human beings.... Blessed are those who trust in the Lord; the Lord will be their trust." (Jeremiah 17: 5, 7). What is the word of God saying to us this Thursday of the second week of Lent? God is the primary cause of every good thing in life: health and medicine, family, money and possessions, job and social status. All the gold, silver and diamond belong to God. He provides food to all living things. Your future, destiny and security lie in His mighty hands. How foolish it is to place your trust in mortal man who cannot save himself. Nobody gives that which has not says an old Roman proverb. 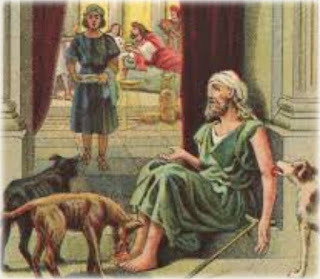 In the Gospel of today, we see the rich man who did not see Lazarus day after day lying at his door tormented by hunger. The rich man trusted his wealth but unknown to him is the fact that his enjoyment is for a short season. Then one day, he died suddenly. Lazarus died too and the table was turned. Lazarus who trusted in God went to heaven. The rich man was gnashing his teeth in hell. "Praise to you, O Christ, king of eternal glory! Blessed are those who, with a noble and generous heart, take the word of God to themselves and yield a harvest through their perseverance. Praise to you, O Christ, king of eternal glory!" (Cf. Luke 8:15). Do you know that the Lord is kind and merciful? The happy return of the prodigal. Did God make a terrible mistake? Your words are spirit and they are life. Imitate your Father in being merciful.